I have a wordpress website for my girlfriend, who is a photographer. It has a starting page, which is basically just a portfolio filled with pictures. Unfortunately, when searching the website in google, google lists all other pages (that have text content, like about me, or contact) above the portfolio. Is there a way to make google list the start page instead, and show the other pages as subentries? There are two main strategies to make the home page rank higher than its sub-pages: on-page SEO on off-page SEO. Unless the search phrase you are targeting is competitive, just a little nudge to Google might get your homepage ranking. For on-screen SEO, you would add key textual content to the homepage, and perhaps do other things like add a hCard. For off-screen SEO, you would leverage links from other pages to convince Google the home page is the authoritative page. You can do this with your internal linking, by putting your targeted keywords into the anchor text of the links to the home page. You can also work to get other websites to link to the homepage, and aiming to get the targeted keywords in your anchor text. Some websites (like StackExchange) will allow you to have a link to your home page — and this will have some effect, if the links do not have the "nofollow" tag — whether they have nofollow varies by website. One other technique you might try is putting a canonical URL tag on your about page that points to the home page URL. This could be useful if your home page has equivalent content to the about page, but represented in a less SEO-friendly way (e.g., inside graphics). You are basically saying, “These pages are equivalent, but please send users to this one.” If that’s not really true, then use this technique at your own risk — “tricking” Google is a dangerous game to play for SEO. If the information the user would want is on your about page, and not on your home page, shouldn’t you change that? Search engines look for a relevant match at url, title tag, meta description tag, h1-h6 tags, body etc. In your current situation the search engine doesn't take your homepage as the best match for the search phrases you use. So you need to add some textual content to match these search phrases. Add some headings and paragraphs of relevant to your search phrases textual content on your homepage. It may be placed below your graphic content if you wish your pictures go first. And make sure you use adequate alt and title attributes within your img tags for your images. And, that goes without saying, all your internal pages should be linked to homepage. 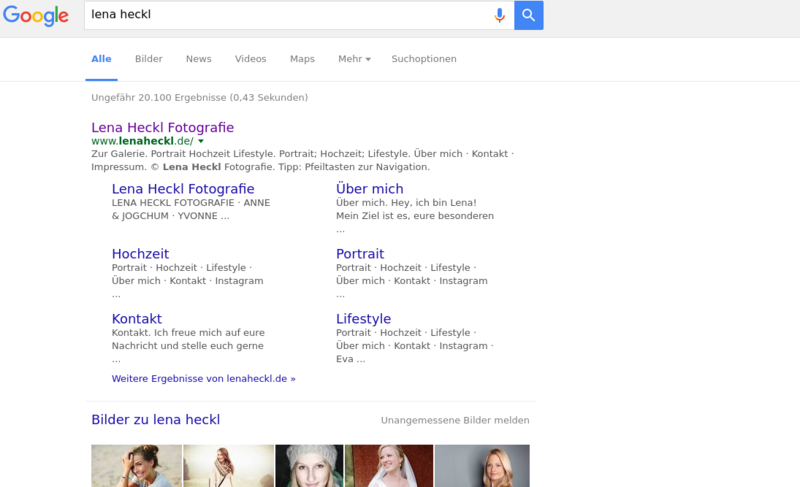 If you have no text on your home page, only images, then there is nothing for Google to index. You MUST have textual content of some sort. In your case, alt and title may work for the images but you should also take advantage of the <meta> description element containing a description of the page. Google might use that for indexing of the home page. its a simple answer. No text on page= NO search engine listing. search engines are looking for texts. The text needs to be in the page CONTENT area. Not in the header, not in the sidebars and not in the footer. BTW google is a privately owned website, just like yours. And they have criteria for being listed, and if you dont have that criteria they dont have to list you, and they wont. It doesnt have to be a large amount of text, one to two sentences is enough. Just make sure you actually TELL people whats ON your page. Surely one sentence about the photographer, and the photos they'll find isnt going to mess up your page. and again, simply, you can have the greatest looking page in the world, but if no-one ever sees it... this will leave you having to rely on other methods to get people to your site, like links from your facebook page, ads in classifieds sites, paid ads on either adwords or an ad network, paid advertising on other peoples websites. You want a free listing on search, you need texts. and nicely said, youre not the only photographer site online. If you want to outrank all the others you actually have to do more than the others. Not less. You should be excited that you have Featured Snippets for your direct search result. It means Google trusts and knows your site. It also means your WordPress schema is working well. As far as moving one snippet from the right to the left you would be splitting hairs. Typically Google organizes these based on various factors like popularity of page (historically based on internal links to page) and page relevance to immediate search result. Chances are if you added Portrait to your search result it would move them around to reflect your immediate interest. What about SEO in one page website with ajax loaded content? How can I get my homepage to be displayed in my SERP instead of inner pages? How do I get google to show my page's structure in its results?